On Saturday May 11 2013 ONA BOSSA will performat the Foundation Vallpalou. 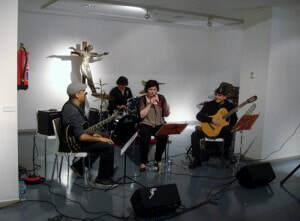 ONA BOSSA is a bossa nova band created in 2011 in Lleida. And with the collaboration of Jordi Sanahuja at violin. Based on the model of the magical and priceless meeting Vinicius de Moraes, Toquinho and Maria Creuza La Fusa, a journey through different musical territories of Brazilian bossa following the sonic imprint of the compositions of the great authors of the genre, Antonio Carlos Jobim and Vinicius de Moraes himself mainly. ​So, are among his repertoire with songs from the height of “A Felicidade,” “Wave,” “Bent,” “Tomar”, “Agua de beber” and “tune”, among others. In addition, with the intention of mixing and fusing two seemingly different worlds and distant transported to the world of pop and rock bag Anglo topics like “Boys Do not Cry” by The Cure, “Sitting on the Dock of the bay “by Otis Redding,” Light my Fire “by the Doors and” More than this “by Roxy Music.